This episode begins with an historical overview of King Records and its founder Syd Nathan. Darren Blasé, a noted historian of King Records, participates along with Randy McNutt, author of the just released book The Cincinnati Sound. The legacy of King Records stretches across over six decades of music history. Started in 1943 by Syd Nathan in Cincinnati, King Records defined the times with not only the types of music recorded, but also the way records were released to the public. The early music of King Records from the 1940’s and early 1950’s is included in part one of the special with songs by the Delmore Brothers, Cowboy Copas, Grandpa Jones, Bullmoose Jackson, Roy Brown, Boyd Bennett & His Rockets, the Casinos, Wynonie Harris, the Royals, and many others. Part 2 features the strong rhythm & blues recordings of the 1950’s. Interviews with Philip Paul and Otis Williams, and other members of the roundtable discussion is included along with others with ties to King Records over the years. There is music from Little Willie John, Otis Williams and the Charms, Hank Ballard and the Midnighters, The Dominoes, Freddy King, Rusty York, Philip Paul’s work as a session player, and many more. Part 3 features stories and recordings from the 1950’s and 1960’s. There is an interview with Waddell Falland, who played with James Brown as a member of the Famous Flames. Mr. Falland discusses his work with the Solars and Bobby & the Expressions, as well as the Famous Flames. Also included is more of the roundtable discussion moderated by Larry Nager with Keith Little, Jimmy Railey, Rufus Allen, J.J. Peterson. Also, there is sound actualities of Syd Nathan addressing his staff back in the early 1950’s. King Records defined the times with not only the types of music recorded, but also the way records were released to the public. From blues and country to rhythm & blues, King Records was an active player from the mid-1940’s to the late 60’s when Syd Nathan passed away. 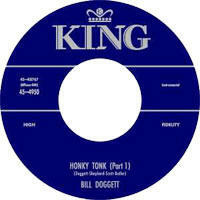 One of the main reasons for King’s success was the economical approach to the record business. Every step of the process was done within the walls of King Records. From recording, to pressing, designing and printing album covers, and placing in the warehouse for distribution… all of these activities were performed in a self-contained facility. This system was a stroke of genius by Syd Nathan – a way to lower his costs and remain in competition with the major labels. Lonnie Mack I'll Keep You Happy The Wham of That Memphis Man! Lonnie Mack Memphis The Wham of That Memphis Man! Lonnie Mack Wham The Wham of That Memphis Man! Through the years since King Records pulled out of the studios in Evanston, there have been attempts by several individuals to honor the label and its founder. Syd Nathan was inducted into the Rock and Roll Hall of Fame in 1997. But, the famous building at 1540 Brewster Avenue still sits there with no plaque, no memorial, no statue of Syd Nathan… a plain concrete building. James Brown visited the building a few years ago with hopes of bringing attention to the historical landmark. Bootsy Collins is currently trying to get the building restored. Perhaps with his efforts plus support from blues fans and Cincinnati City Council, King Records will be officially recognized as a testament to its important contributions to the country’s musical heritage. One only need to review the success of the King Tribute concert at this year’s Cincy Blues Fest to know that there are still fans of this important part of Cincinnati’s history. Part 4 focuses on the legacy of King Records with a look by Stuart Holman at Freddie King and Albert King's influences on Eric Clapton and Stevie Ray Vaughan. There is also a roundtable discussion of King's legacy with contributions from other musicians as well. King Records: Cincinnati Legacy, Part 5 is a tribute to two rockabilly legends still living in the Greater Cincinnati area - Bonnie Lou and Rusty York. Bonnie Lou was famous for her work on the Midwestern Hayride and also WLW. She also recorded for King Records back in the 1950s. These songs launched into the Rockabilly Hall of Fame. We were thrilled to have Bonnie Lou come into the WVXU studio on November 28th, 2007, to talk with local music historian Randy McNutt about her career. She currently lives in Anderson Township on the eastern side of Cincinnati. Rusty York is also in the Rockabilly Hall of Fame and recorded at King Records in the 1950s. He is still owns Jewel Recording Studio in Mt. Healthy, on the northern side of Cincinnati, and resides in Indiana. We were very lucky to have Rusty come into the studio on November 15th, 2007 and share stories about his career at King Records with local musician Stuart Holman. You can find more information along with photos of each musician in Randy McNutt's book, The Cincinnati Sound.